var fullName: String = "First Last"
Also, sometimes users might not have a last name. var fullName = "First Last"
In Swift 2 the use of split becomes a bit more complicated due to the introduction of the internal CharacterView type. This means that String no longer adopts the SequenceType or CollectionType protocols and you must instead use the .characters property to access a CharacterView type representation of a String instance. (Note: CharacterView does adopt SequenceType and CollectionType protocols). let fullName = "First Last"
let fullName    = "First Last"
let fullName : String = "First Last"
A new function split in Swift 4 (Beta). Here is the way multiple delimiters with array. let mathString: String = "12-37*2/5"
As an alternative to WMios's answer, you can also use componentsSeparatedByCharactersInSet, which can be handy in the case you have more separators (blank space, comma, etc.). If you just need to properly format a person name, you can use PersonNameComponentsFormatter. The PersonNameComponentsFormatter class provides localized representations of the components of a person’s name, as represented by a PersonNameComponents object. Use this class to create localized names when displaying person name information to the user. 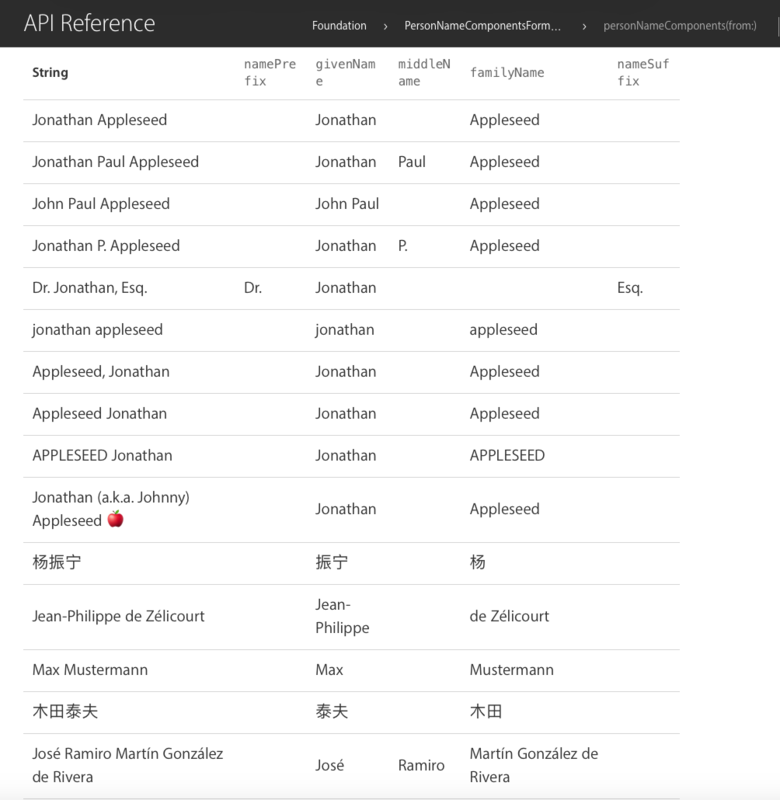 let name =  "Mr. Steven Paul Jobs Jr."
nameFormatter.string(from: nameComps)   // "Steven Jobs"
nameFormatter.string(from: nameComps)   // "Mr. Steven Paul Jobs jr."
nameFormatter.annotatedString(from: nameComps)   // "Mr. Steven Paul Jobs jr."
If you ever need to shake your grip on reality watch a WWDC video on strings or dates. In short, it is almost always better to allow Apple to solve this kind of mundane task. The way to do this correctly, IMHO, is to use NSCharacterSet since as stated earlier your whitespace might not be what you expect and Apple has provided a whitespace character set. To explore the various provided character sets check out Apple's NSCharacterSet developer documentation and then, only then, augment or construct a new character set if it doesn't fit your needs. let longerString: String = "This is a test of the character set splitting system"
let items = str.components(separatedBy: " ")//Here replase space with your value and the result is Array. print(line.split(separator: " ", omittingEmptySubsequences: false))//array contains empty strings where spaces were repeated. print(line.split(separator: " ", omittingEmptySubsequences: true))//array not contains empty strings where spaces were repeated. Swift 4 makes it much easier to split characters, just use the new split function for Strings. Now you got an array with 'hi' and ' hello'. let line = "AAA    BBB\t CCC"
I had a scenario where multiple control characters can be present in the string I want to split. Rather than maintain an array of these, I just let Apple handle that part. Most of these answers assume the input contains a space - not whitespace, and a single space at that. If you can safely make that assumption, then the accepted answer (from bennett) is quite elegant and also the method I'll be going with when I can. let searchInput = "  First \r\n \n \t\t\tMiddle    Last "
See the Apple's documentation here for further information. let fullName: String = "First Last @ triggerd event of the session by session storage @ it can be divided by the event of the trigger." let str = "one two"
self.fname = fullNameComponents.count > 0 ? fullNameComponents: ""
self.sname = fullNameComponents.count > 1 ? fullNameComponents: ""
var fullText = "Hello World"
let complete_string:String = "Hello world"
You just write 2 line code and you will get the split string. let fullName = "FirstName LastName"
Here is an algorithm I just build, which will split a String by any Character from the array and if there is any desire to keep the substrings with splitted characters one could set the swallow parameter to true. String handling is still a challenge in Swift and it keeps changing significantly, as you can see from other answers. Hopefully things settle down and it gets simpler. This is the way to do it with the current 3.0 version of Swift with multiple separator characters. // Or if the enums do what you want, these are preferred. I haven't found the solution that would handle names with 3 or more components and support older iOS versions. var fullName = "James Keagan Michael"
let first = fullName.components(separatedBy: " ").first?.isEmpty == false ? fullName.components(separatedBy: " ").first! : "John"
let last =  fullName.components(separatedBy: " ").last?.isEmpty == false && fullName.components(separatedBy: " ").last != fullName.components(separatedBy: " ").first ? fullName.components(separatedBy: " ").last! : "Doe"
If a fullname is invalid, take placeholder value "John Doe"
Not the answer you're looking for? Browse other questions tagged ios string swift split or ask your own question. How to make string fast enumeration in string in Swift? How do I get the last value in a string separated by commas? Swift : How to convert String to [String]?